Tom and Linda got this Split Pedestal Extension Dining Table in oak with Wheat stain. It’s a lovely little table for their Rhode Island home, isn’t it? What the picture above doesn’t show you is that sweet little table can open up and become huge. The pedestal splits into three and the 42” round model can accept up to seven leaves. Tom and Linda bought four leaves with skirts. Here’s a catalog photo of an extended table. 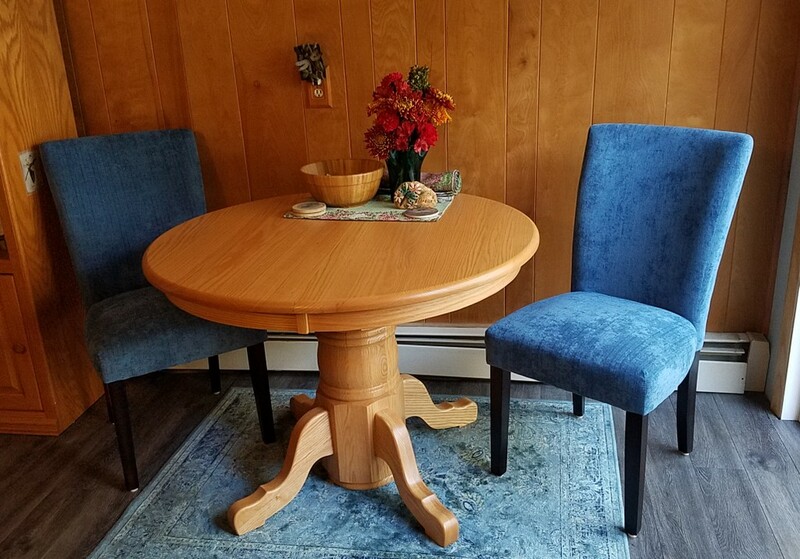 While this dining table is elegant between uses, it keeps Tom and Linda ready for holiday meals, so they don’t have to keep an extra table around. This entry was posted on Wednesday, November 21st, 2018 at 7:00 am	and is filed under Our Satisfied Customers. You can follow any responses to this entry through the RSS 2.0 feed. You can leave a response, or trackback from your own site.